My four-year-old son made this little verse while we were riding a bus to the downtown. 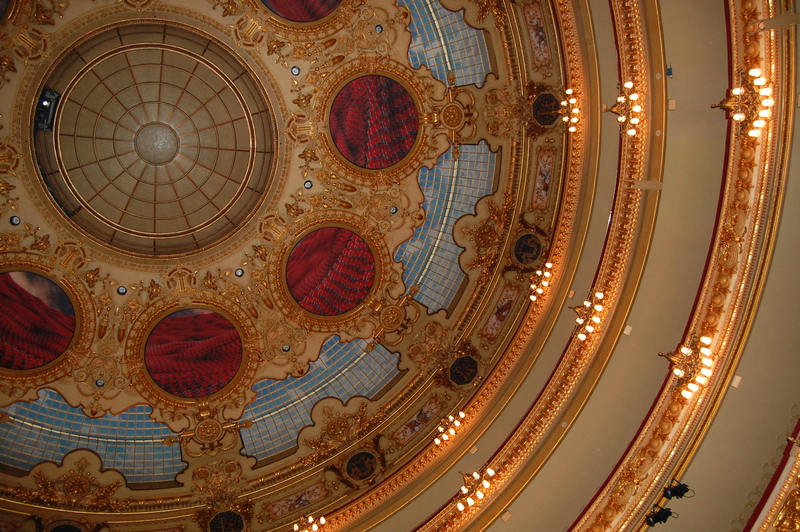 We strolled through the touristy streets of Barcelona and ended up at the Liceu. 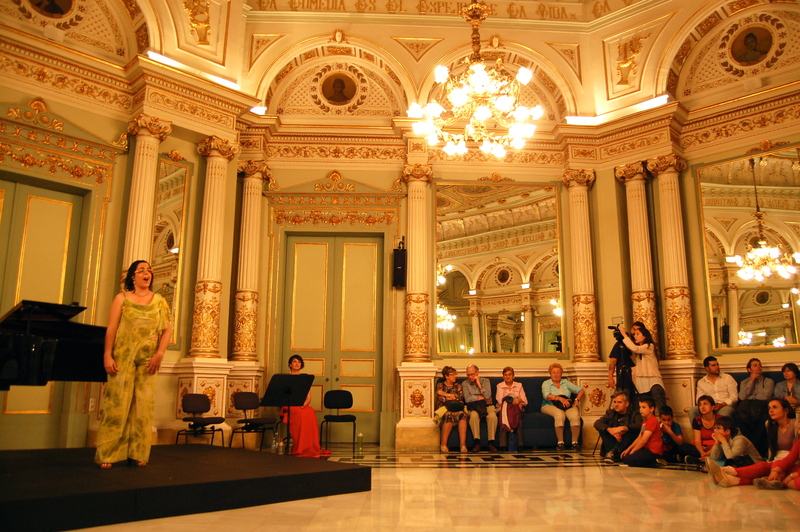 We were sitting in the first row, on the floor, listening to the opera arias performed in the Liceu hall. 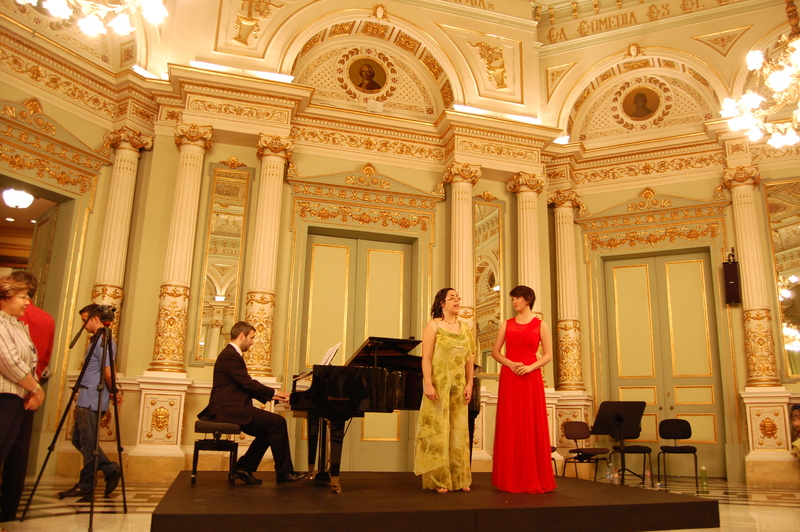 My son with his eyes fixed on the singer and the pianist. His little body, so stout and strong, felt intense. After couple of arias I asked him, “Do you want to go or to listen more?”. “I want to listen more,” he replied without looking at me. We sat and listened. I love live music and ballet very much. However, I am not that interested in listening to the same music on CDs or watching the same ballet on my ipad. We rarely have any music playing at home. Like my son, I am absorbed by the beauty and intensity of the sound when it is produced in front of me. I am actually glad that he wants to listen more. I want it too. It is not comfortable sitting on the floor, but we do not notice it. The deepness of the voice and the music occupies all the space in the hall. The beauty is born at the intersection of the passion with which he listens to the music and the uniqueness of the voice that produces it. Today we listened to the music and we understood it. It made us experience the sound in a way that left a long lasting impression on how we will live today, tomorrow, and the rest of the days. I know this because we were silent and did not talk. Because we do not like to listen to the same music on the radio. Because we both in order to experience something need to pay full attention to it and understand it. “Let’s go,” my son stood up and we went towards the exit. He gave me his little hand and I held it tight. On the street he said, “Let’s go get some ice-cream.” And I agreed. Then he added, “Do you remember, mom, this is our world in reverse?”. And he laughed at what we said because he found it very funny. 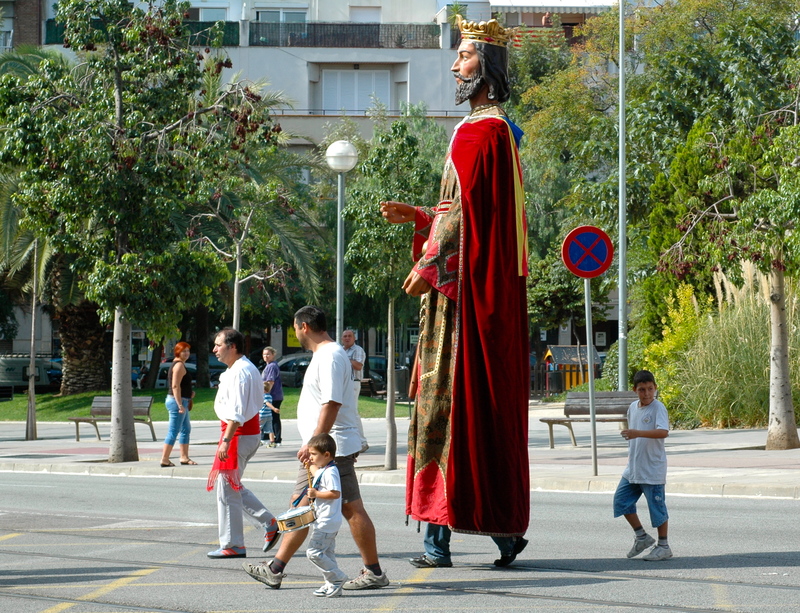 This is the second time that we were fortunate to see Trobada de Gegants (Gathering of the Giants) in Esplugues de Llobregat, Barcelona. And this year the event was as good as the last year. First of all you see a lot of happy faces. And there are just enough people to feel the spirit of the fiesta and not to be overwhelmed by the crowd. 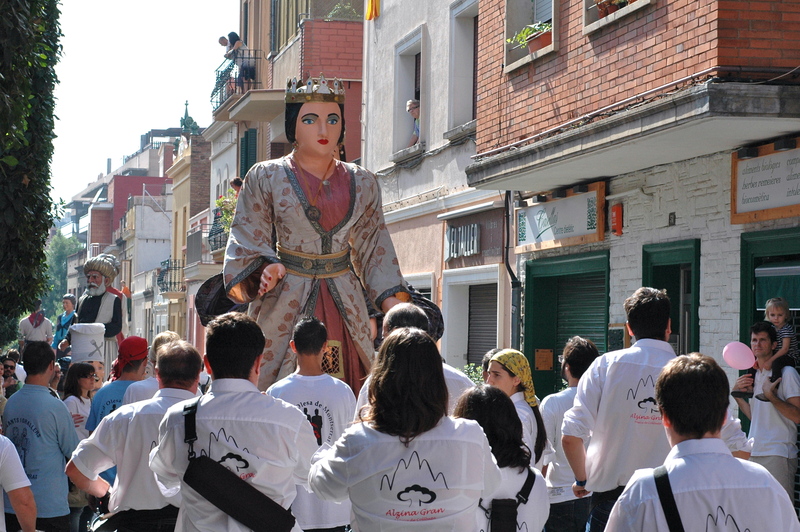 You can move freely, touch the giants, and talk to people who will carry them and to the orchestras accompanying the giants. 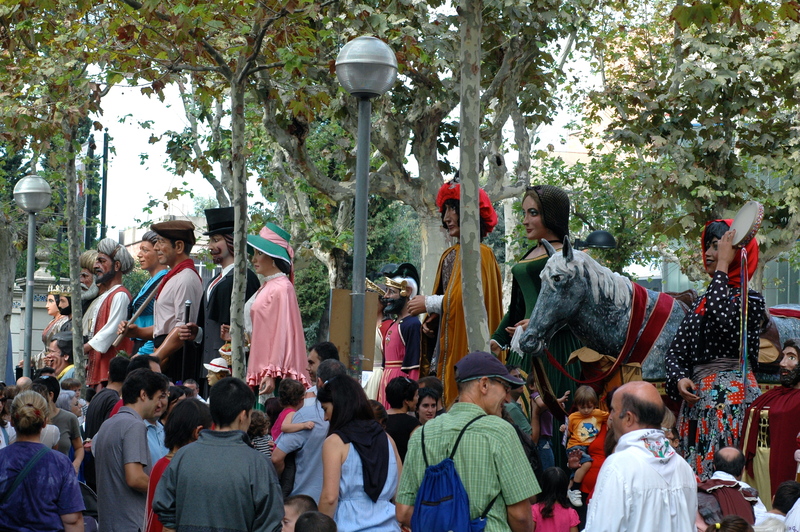 Each set of giant dolls represents different regions of the Barcelona area and is accompanied by orchestras and helpers. 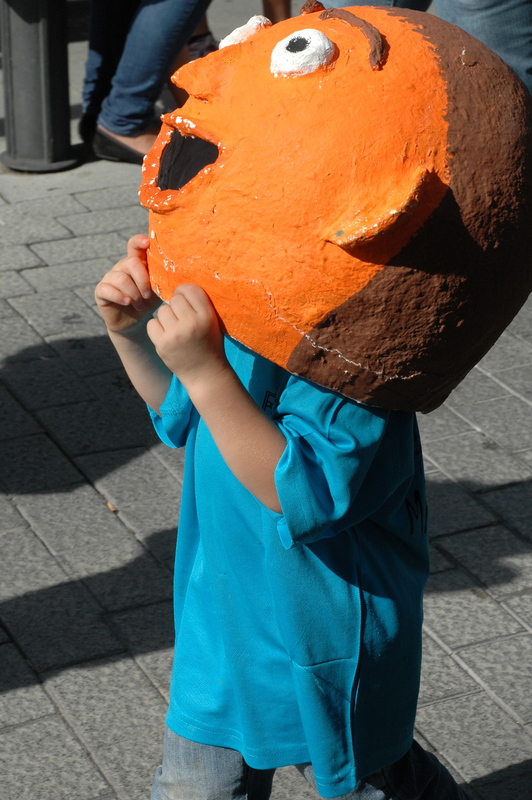 The kids are welcomed to try on the papier-mâché heads, to play the drums and to take tons of pictures. The event is very well organized and thought through, but what makes it truly unforgettable are the kind and welcoming people. Everybody is smiling, dancing, and following the rhythm of the fiesta. Nobody gets upset, not even when some of the giants sprinkle water all over the crowd. 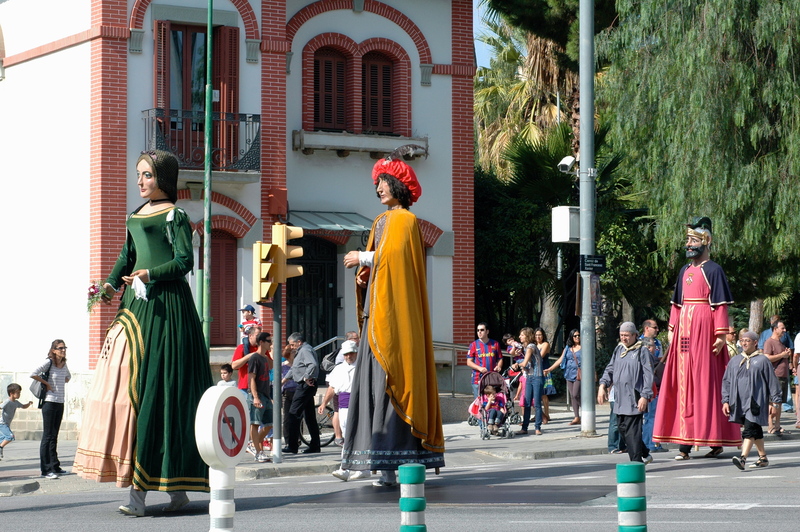 There are lots of people and the procession of dancing giants spreads out along the entire street, however people do not work with their elbows to get a better place for themselves and their kids. On the contrary, they constantly look around to make sure they are not obstructing the view of others or are not in the way of a stroller or a wheelchair. If you close your eyes, relax and open them again all you see are happy kids in a middle of their favorite game. The enjoy it! But what makes those smiles and laughs really priceless and beautiful is people’s thoughtfulness of others. It is the fact that we enjoy it because we enjoy it all together. And that if the person next to you is happy, you enjoy it even more. We took a sightseeing tour in Santiago de Compostela. I got to sit with the three kids, my son and daughter and my daughter’s friend. We sat in the small white train that runs through the city for 45 minutes. My daughter and her friend decided to say “Hola!” to the people on the streets. 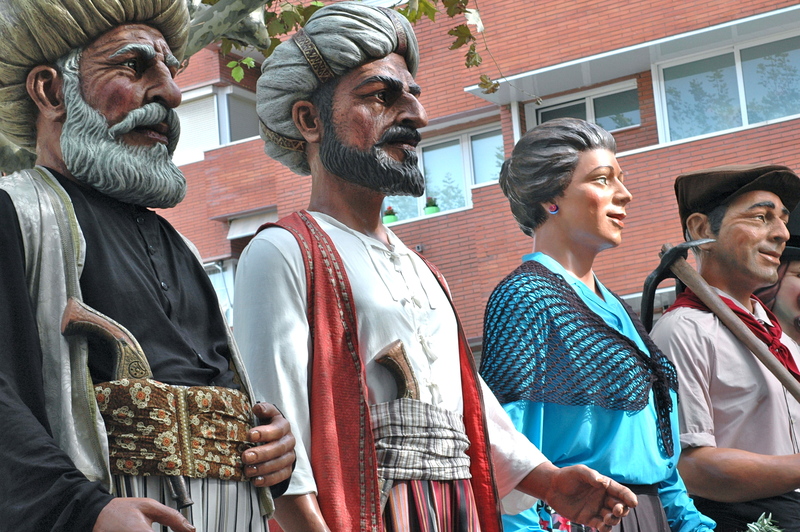 I did not stop them, even though their enthusiastic waving and saluting prevented me from diving into the city´s past. 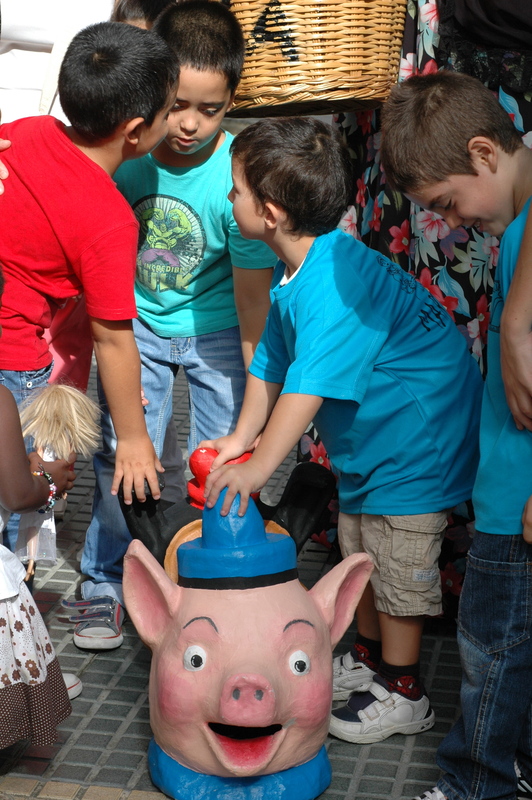 To my surprise almost everybody on the streets smiled at the happy kids and waved back. The waiters, the hotel service workers, the old men sitting on the plaza, the woman walking two small dogs, students on the bikes, a couple with a Great Dane, men and women inside their cars stopped in the evening traffic, the lottery vendor, the beggar, the souvenir vendors, people chilling out at the cafés, people checking out their maps… and everybody else we passed by on the train. They heard the happy “Hola! Hola!” coming from the train, they saw the two five year olds waving and smiling at them and for a second or two they forgot about their own worries and routines. The simple childhood smile rippled through their lips. I think that during our 45 minutes ride we encountered around one hundred people, and all of those who heard “Hola!”, waved back and smiled. The kids enjoyed saying “Hi” to strangers. Their enthusiastic “Hi” was an invitation to share that moment of childhood happiness. Simple, unrestricted, unattached, abstract and light. It was that unexpected smile that lands on our lips when we are busy with something else and did not intend to smile. It felt good that so many people suddenly smiled back at us. As they smiled their steps became lighter, their words kinder and their eyes looked shinier. I am learning from my kids how to smile openly and say “Hola!” to strangers. And the amazing thing is that people are grateful for that light in our eyes. Mature people intimidate me. Greatly. I am thrown aback by their seriousness and feel like a child talking to a busy grown up who does not have time for my words. I nod to their assumptions because they are so secure of the stability of their own words and their rightness. And with years I became good at this game of grown ups. I make a serious face, follow up their thoughts with a nod and do not interrupt them with abstract question weather or not they like butterflies and what color of the butterflies’ wings they are attracted by the most. Nope, I don’t collect butterflies. I shiver at a thought of it. But I like the lightness of their flight and the transparency of their wings and their ability to color the fields in spring. It was well after midnight and I was talking to a friend of mine in a small bar in Santiago over a pitcher of Sangria. And we were talking like grown ups, about life, people and thoughts. About work and travel and money, and everything else that mature people normally talk about. And somebody overhearing our words would be sure that we were two grown ups having a night out over a pitcher of summer fruity alcohol drink. But I knew that butterflies were not out of question. Should I start talking about butterflies, stars or dreams, I would be heard, understood and smiled back at. The conversation would not stop there, and it would take an amazing new turn. But it was late, we were the last people in the bar, the waiter had already cleaned the floor, put all the stools on the tables and was occupying himself with something just not to disturb us. We paid the bill and left. The nights in Santiago are cool, a breeze maneuvers through the narrow streets and lightly nudges you on the back. Its good that old houses protect you. You and your silence and the unspoken words on butterflies. Only knowing that you can also talk about butterflies, you suddenly become a nice mature person for an hour or two on a cloudy night in Santiago. I do not like street music. I mean, I do not notice all these people who play their guitars, accordions, flutes and violins on the streets in front of the restaurants. They do not annoy me generally, but they do not make me smile either. Yesterday we had lunch in a nice white restaurant out of the touristic downtown. The food was good and cheap. You always know that the restaurant in Spain is good when it does not look polished and expensive. The best food I had is in those cheap and busy places, where the waiters are always running pass your table. Still they remember your order and start by putting a ceramic pitcher of wine and rough Galician bread on your table before asking the food order. In these places the word “drink” includes wine too, whether you ask for water or wine the price is the same. We just had ordered the food when we heard the music. It was gentle and nice. It had no vulgarity among it sounds and when the food was served, I could not eat it. It felt like eating in a music hall. If I hear music I like I can´t do other things except listen. And so I listened. Two men played an oboe and a guitar on a corner of a nearby plaza. And I stood up and crossed the plaza and put some money in their guitar case (they did not have the hat or bag for collecting money in front of them). They smiled kindly back at me. And somehow I felt very grateful. It was a gift to hear that music. After a while they moved closer to our tables and to my surprise played my favorite music piece, the Turkish Rondo. They played it in a very unusual way. Instruments talked gently, like the most humble person I know, and even humbler than that. The sound was so light that it barely touched you. The music, like a gauze cape over your shoulders did not protect you from anything, did not keep you warm, had no weight. But you, like everybody else, felt the essence of beauty that lay within the folds of its transparent weave. It radiated light akin to a child´s smile and to the flight of a butterfly. When you land in Barcelona at night the runway looks like a field ready for some magical game. Red and green lights signal awkward rules to the unknown players. Whether we know it or not, we are a part of it. And I was wondering if others also see the runway in the night as a field ready for some magical, unfair, unrestricted, unknown, but still amazingly beautiful game. There are certain things that we do not forget easily. And so I will carry these hundred smiles that our children provoked, the midnight Sangria talk and the unasked question about butterflies and the gauze cape weaved by the oboe and guitar “improvising” on the Turkish Rondo. And earthy thick wine in a terracotta pitcher and the rough bread, all done by sunburned and kind hands of village people on Galician fields. The simplicity of it all sneaks into your heart like a child´s smile. And the moment later you turn the corner and carry it with you for the rest of your life. And you give back. And you give it away. As it would be impossible and too painful to save all these feelings just for oneself.